As we move through January and into February, mortgage lending sits in its lowest point of the year. From 2010 to 2014, our mortgage quote data showed that November through February are the four months with the lowest average amount of mortgage quotes throughout the entire year. While it’s easy to sit back and wait for the market to pick back up again when spring comes around, there are some incredible simple things you can do to help improve your lead generation in this “slow period”. Much like a restaurant might have a special menu, or a car dealership could host a sales event, using the season to reach out to potential prospects with seasonal deals and updates is a great way to get your business in front of leads and get people thinking about what they want in a lender. Even if a lead isn’t looking into borrowing right away, getting your business in front of them just before the mortgage quotes begin to pick back up in the spring can put you ahead of other businesses who may not have spent as much time connecting with those prospects. Engaging with people on social media is one of the best ways to connect and put yourself in front of leads; it’s easy, costs virtually nothing, and can instantly connect you with anybody. Maybe you want to share a blog about what’s been going on with your company, or you might want to reach out to people talking about your business online. Establishing an online presence that can be seen and felt by potential borrowers, especially in a day and age where the digital space is more relevant than ever, can get people talking about your business, and get leads coming in the door. Even with all of the layers of connectivity the internet provides, generating support via word-of-mouth still does wonders for businesses. 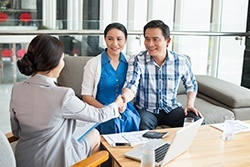 Taking out a mortgage loan isn’t something most people do lightly, and the odds are that they’ll be consulting friends, family, and even strangers on who is the best lender to trust. Recommendations from past prospects and reviews online are big drivers for leads when they’re looking for whom they want to borrow from, and having positive words from past prospects about going the extra mile can go a long way. Maybe your prospect’s rate has changed (which you can keep track of with our custom rate tracker functionality). Let your prospect know, while simultaneously showing them that you’re looking out for them, and keeping them updated as things progress. In a time of the year when leads are especially scarce, having them be directed to you by others is a major positive. Because this “slow period” is typically at the end of the year/beginning of the next calendar year, most people are already setting goals and looking to raise the bar from years past. When doing this, why not start planning out things like marketing campaigns and strategies when it comes to generating leads? Getting a head start while reflecting on what worked and didn’t work in the past can help optimize lead generation and ensure that you’re putting your time and resources where they matter most, thus maximizing the amount of leads you’re bringing in. Whether you’re reaching out to new leads with email and social media, or connecting with old prospects to ensure they’re staying updated, Mortech can help you cover every aspect of lead generation and management. Contact us today to learn about how our mortgage pricing engine and its accompanying tools can help improve your business and keep leads coming in from the cold of the winter into the heat of the summer.